There are many different problems relating to float loading and every trainer has their own method of teaching horses to load on floats. I believe that if horse owners learn my Ten Step program, they will never have problems with float loading any horse. Once the horse has learned the Ten Steps, he will be calm and submissive and will trust the owner/handler in a float loading situation. The owner/handler will have learned the skills and developed the confidence necessary for dealing with float loading, even when the horse is fearful or has learned that the horse float is a place to avoid. Horse refusing to go near the float. One of the common ones is the horse will step to the side of the tail gate by swinging his hind quarter around. This is normally caused from too much pressure from behind using bum ropes, whips and sometimes, sadly, electric cattle prodders. Horses start thinking they should not stand in the centre of the tail gate as this is where all the pressure starts from. In most cases, when the horse steps around to the side, the bum rope gets released and the horse is lined back up to the centre of the tail gate and then the pressure is applied again. The horse has just learned that there is too much pressure in the centre of the tail gate. Teach the horse where the comfort zone is! I base my training on a “Comfort Zone” because all horses have a great need for comfort. Don’t we all? We have to convince the horse that the centre of the tail gate is safe. This is where my “Pull & Release” technique comes in. Before we start with a problem loader I go through my Ten Steps. 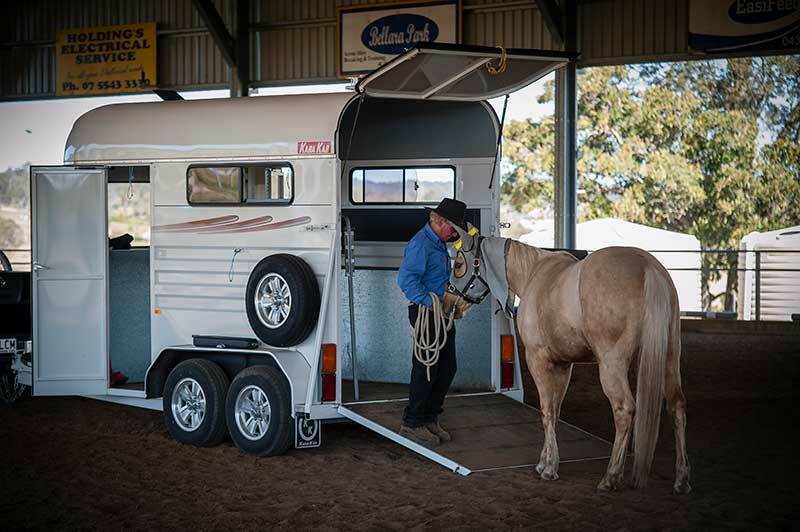 Step 2 – ” Standing Still” which this is very important for when you get your horse inside the float. Step 3 – “Touching & Relaxing” is very handy so i can walk behind my horse and rub him on the rump when he is standing in the float. Step 4 – “Backing” teaches him how to step back one step at a time, so that he doesnt rush out of the float. Step 5 – “Flexing” – so he can flex around while standing in the float & look back at me instead of rushing out backwards. Step 6 “Yielding to Upward, Downward & Forward Pressure” – these are ‘a must’ before you ask your horse to load. If you have a nervous horse, you can set up a few obstacles, like stepping over a log, walking over an old piece of carpet & when confident enough, walking over an old plastic tarp, through a narrow gate way or stable door, preferably with a step up. The better your horse will follow you, the more confident he will be to follow you into a float. I like to use my JC Training Halter and a long lead. If you have a very explosive horse, make sure your lead is longer than 5 metres. The idea is to allow him to run off to the side of the tail gate and follow it through with a “pull and release”. Make sure you do not jerk the lead. So walk your horse up towards the float, on a “loose” lead. I like to keep my hand open so my lead is just resting in my hand and the rest of it coiled up in the other hand. This stops you from dragging or pulling on his head. Walk up into the float and if your horse tries to step on the tail gate, go back to him and reward him with a rub and a little break as this effort is what I would call a 1% try. If your horse steps off to the side to avoid the tail gate, quickly step out to the other side & apply a ‘pull & release’ then set your horse back to the centre of the tail gate and reward him by showing him this is his “comfort zone”. Some older horses that have had alot of pressure around floats, when you do your “pull & release” will sometimes throw their head up and go backwards more, but don’t fight wth him by holding onto the pressure, just keep following it through consistently by repeating the “pull & release”. Study “Pull & Release” in DVD Steps 2 & 3, as this will really help you and your horse to overcome his problem. If your horse keeps throwing his head up, it means you are jerking the lead… Don’t forget, the “Pull & Release” is a ‘smooth’ pull and a quick ‘release’. If your horse steps onto the ramp even with ONE foot, reward him with a rub on the neck and then ask him to back away from the float at least 5 or 6 steps then take him for a walk and try again, every time you try again ask for a little bit more, once he steps two front feet on let him stand there for a minute and then back him off. When he’s comfortable stepping his front feet on the tail gate then focus on the back legs. Every time you see him lift up his back leg toward the tail gate, stop and reward him, until eventually he will step both back legs onto the tail gate, then back him off and take him for another walk, until eventually you can walk him all the way to the chest bar. If you have a very nervous horse, really watch for that 1% try and back him off, take him for a walk to give him time to think about it. Some older horses when they step their back legs onto the tail gate, will rush forward to the chest bar, this is caused due to too much pressure from behind eg. bum ropes, whips, even swinging a rope behind them to drive them forward into the float. I normally find if i spend enough time taking one step forward and then backing them off, by the time they step their back legs on the ramp they normally stand without rushing forward. You’ll find using this calmer approach will build your horses confidence so eventually the idea is to put the lead over his neck and ask him to walk politely into the float by himself. My book, JC’s Ten Commandments has more information on loading problem and young horses.